COLORADO SPRINGS — At least a dozen fragments from India’s March 27 anti-satellite test reached altitudes above 1,000 kilometers, meaning some debris will stay in orbit much longer than estimated by India, according to research from Analytical Graphics Inc. (AGI). One fragment was spotted at 2,222 kilometers, nearly eight times higher than where India intercepted one of its own satellites with a ground-launched missile, Dan Oltrogge, a senior research astrodynamicist at AGI, said. That fragment, and others orbiting at high altitudes in low Earth orbit, will remain in space much longer than the 45 days recently projected by India’s Defence Research and Development Organisation, Oltrogge said. Two days after the March 27 test, the U.S. Air Force said it was tracking 250 pieces of debris created when India’s PDV-Mk II missile intercepted at 280 kilometers a satellite dubbed Microsat-R that India launched in January. On April 1, NASA Administrator Jim Bridenstine, lamenting an increased risk to the International Space Station, said that 400 pieces of debris were created. Oltrogge, who runs AGI’s Center for Space Standards and Innovation, said no satellites are known to have been struck by debris from India’s ASAT test. He cautioned, though, that satellite operators may not disclose such information if there was a strike. AGI data showed that multiple Russian Kanopus remote sensing satellites and Dove satellites operated by commercial company Planet were among 25 spacecraft most at risk of intersecting with debris paths from the ASAT test. The European Space Agency’s Aeolus wind-mapping satellite, which launched in August, was also among the 25 most-at-risk satellites. 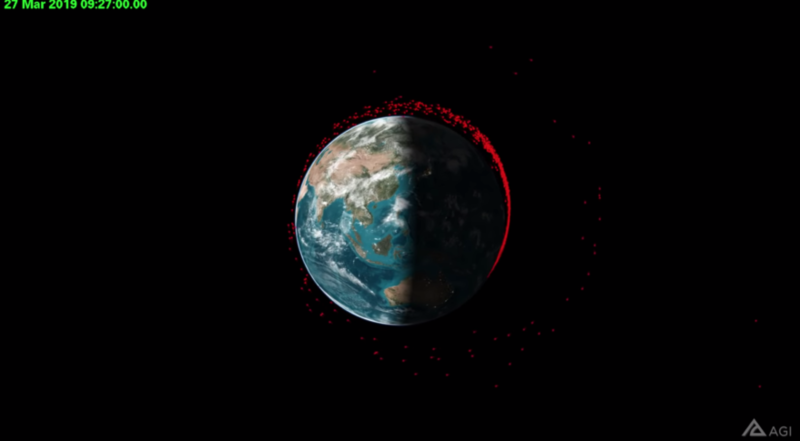 That risk isn’t exactly the same as hitting a satellite, because the probability of an impact also depends on the size of the satellite and the debris, he said. The ISS, which orbits at roughly 410 kilometers, was among the top 60 spacecraft threatened by the debris, according to AGI.